Buy Sony CD-Recordable 10 Pack [700MB/80MIN/48x] for PC in India at the best price. Screenshots, videos, reviews available. 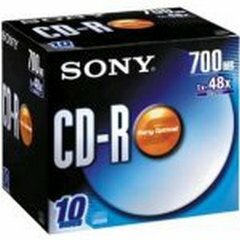 This pack contains 10 pieces of high-quality Sony recordable CDs that have an 80 minute audio / 700 MB data capacity on each disc. Designed for optimum performance in CD-R writers with multi-speed (1x-48x). All CDs are individually packed in slim jewel cases. Pack of 10 recordable CDs. 80 minute audio / 700 MB data capacity.